The Key Biscayne center point is about the area of Crandon Park. Conrad Miami : 1395 Brickell Ave.
Rates shown are nightly rates before taxes and do not necessarily reflect all Key Biscayne, FL discounts available. 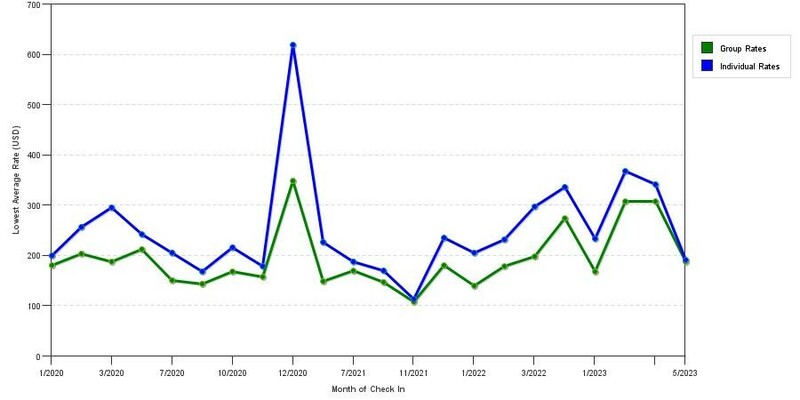 The chart reflects the cheapest Key Biscayne hotel for each day and each star rating category. You can enjoy a warm, sunny visit to Key Biscayne during any season. Highs during the summer peak near 90 degrees and lows typically hover in the upper 70s, offering the perfect weather for those who like it hot. However, since there are many people who don't, in fact, like it this hot, you can usually find great summertime hotel deals in Key Biscayne. Visiting during the summer will also let you attend popular annual events such as Florida Supercon and Miami Spice. If you're planning to visit Key Biscayne during the fall, you should be aware that hurricanes will be a very real possibility. As a barrier island, Key Biscayne is very exposed, so it's typically evacuated even when there's just the threat of a hurricane. Fall temperatures are only moderately cooler, with an average high of 87 degrees in September, 85 degrees in October, and 80 degrees in November. Popular events during the fall are the South Beach Seafood Week, the White Party Week, and the BK Beach Run. Winter is one of the most popular times to visit Key Biscayne because the temperatures are a warm and welcoming alternative to the harsher weather farther north. In December, the average high is 77 degrees. This drops to 75 degrees in January and stays steady at 76 degrees in February. Winter is the most expensive time to visit Key Biscayne and Miami, but seeing and being seen make the trip worth the cost. Popular events during the winter include the Art Deco Weekend in January and the South Beach Food & Wine Festival and the Miami International Boat Show in February. 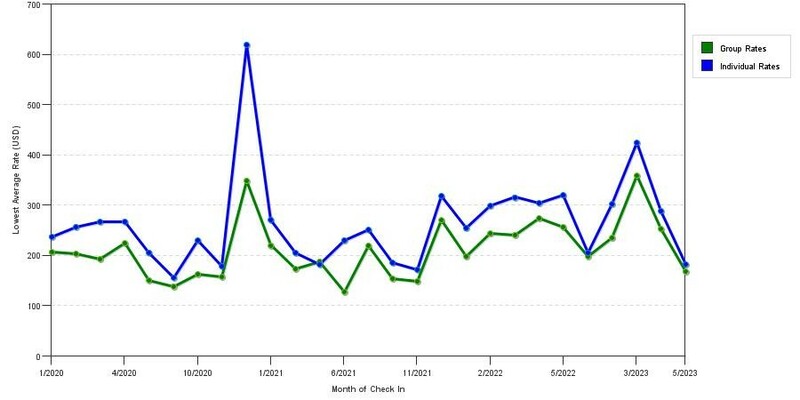 Below we've posted 3 graphs displaying average nightly cost patterns by star rating class in Key Biscayne, FL. 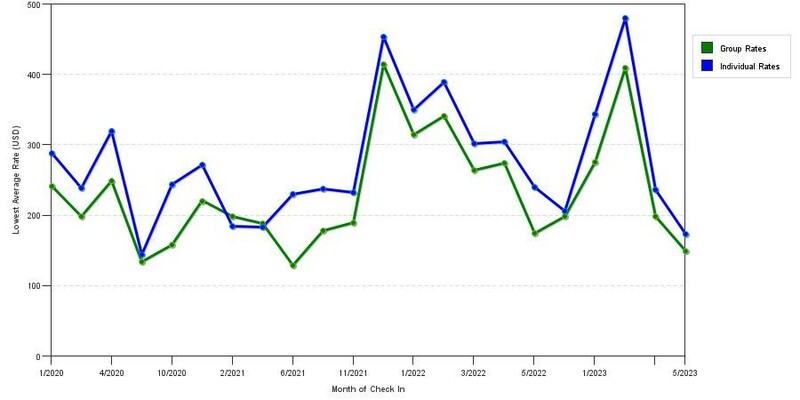 Analyze these charts to evaluate the cheapest time period to book in Key Biscayne during the year. If you're looking for luxury, you'll find no shortage of options in and around Key Biscayne. If you want to stay on the island, book a room at The Ritz-Carlton Key Biscayne, Miami. This hotel features a full-service spa, elegant on-site dining options, and a tennis center. The hotel offers separate family and adult pools, so, regardless of what kind of vacation you're planning to take, you'll find the perfect spot for a splash. If you have kids in your party, the Ritz Kids program will ensure that they're catered to as carefully as everyone else. The Ritz Carlton Coconut Grove Miami, located about 5 miles from Key Biscayne, is equally luxurious. You can relax in the spa, stroll through the gardens, or take a dip in the pool. Enjoy on-site dining at Isabelle's, grab a drink at The Commodore, or savor some snacks at the poolside café, all without having to leave the property. If you want a room with a magnificent view, check out the Conrad Miami, which is less than 5 miles from Key Biscayne. At this towering property, you can stay in a room with either a city or a bay view, and you'll find a spa, a fitness center, two tennis courts, a rooftop pool, two bars, and the LvL 25 restaurant. If you'd prefer to relax in your plush accomodations, order room service and have a decadent meal delivered to you. Vacationers who want to stay in a chic, modern hotel should check out the W Miami. Enjoy a meal at ADDiKT, which has a 360-degree view of the city and the bay. Unwind in the water lounge or steam room at the Ironbrickell Spa, or head up to the rooftop to take a dip in the heated pool. In your room, you'll find a mini-bar, complimentary bottled water, and even a stovetop and a set of dishes. Cozy up in your robe and enjoy the elegant marble bathroom or gaze out the floor-to-ceiling windows in your room. Key Biscayne and the Miami area aren't usually considered to be affordable vacation destinations. Nonetheless, they have many hotels that won't stretch your travel budget. If you're looking for budget-friendly accommodations on this small barrier island, you can't do better than the Coral Reef at Key Biscayne. These spacious accommodations are surprisingly reasonable. You can choose from a one-bedroom loft or a two-bedroom suite. Enjoy all the conveniences of a home away from home, including a kitchen, a dining area, and a living area. Another affordable option is the Extended Stay America Miami Brickell Port of Miami, located about 5 miles from Key Biscayne. Guests enjoy spacious rooms with fully equipped kitchens and a free grab-and-go breakfast offered every day, giving you everything you need to start off your day on the right foot. Other amenities include enhanced Wi-Fi and an on-site coin-operated laundry. Several hotels in the Key Biscayne area offer discounts for eligible guests. The best of these is the Atton Brickell Miami. Here, you'll find special rates for seniors and government and military personnel. This hotel offers a wealth of amenities, including a rooftop pool, a bar, a restaurant, and meeting rooms. The accommodations are simple yet sophisticated, with clean lines and a simple, neutral color palette. Enjoy high-speed internet and 50-inch LCD TVs during your stay. The Hyatt Centric Brickell Miami, located about 5 miles from Key Biscayne, also offers discounts to government and military personnel. This hotel features a heated outdoor pool, a hot tub, and a pool bar. If you want to work off your vacation indulgences, take advantage of the hotel's fitness center, which has free weights, cardio equipment, and strength-training equipment. In your room, you'll find a mini-fridge, BeeKind bath amenities, a 55-inch flat-screen television, and a Hyatt Grand bed. Value hotels give you a wealth of amenities at mid-range prices, keeping you comfortable on a budget. Make sure that you're getting the best perks available when you're planning your trip to Key Biscayne. The Hilton Garden Inn Miami Downtown/Brickell, located less than 5 miles from Key Biscayne, falls into this category. A mid-priced hotel for Miami, this Hilton Garden Inn offers complimentary Wi-Fi and a 24-hour business center, making it perfect for travelers who are in town for work. The outdoor pool area features a poolside bar, a fire pit, and private cabanas with televisions. The rooms have mini-fridges, high-definition TVs, and private balconies or lanais. If you stay here, you'll enjoy all of the comforts that you need at reasonable prices. Homewood Suites Miami Downtown/Brickell, located about 5 miles from Key Biscayne, is ideal if you're planning to take an extended vacation. Here, rooms include full kitchens and sleeping and seating areas, and you can enjoy a complimentary hot breakfast every morning. Dinner and drinks are available from Monday to Thursday, and, on the property, you'll find a covered outdoor pool that's just begging you to take a dip. The business and fitness centers are open 24 hours a day. If you're visiting Key Biscayne, doubtlessly you're looking for luxury. After a long day in the sun, you'll be yearning to sit at a comfortable table covered with delicious food. For some of the best dining on Key Biscayne, visit Kebo. Here, you'll find innovative and fresh Mediterranean/Spanish cuisine. The tapas are great if you want to share small plates with the rest of your party, and the bar offers a wide selection of wine, beer, and cava to complement your meal. Another popular restaurant on the island is Milanezza. This restaurant has a laid-back, vintage atmosphere that harkens back to an easier time. Here, you'll find Argentinian dishes that feature local produce, choice angus beef, and natural chicken. Order delivery or takeout if you'd prefer to enjoy your meal in the comfort of your room. Try Gran Inka for fine Peruvian cuisine. The main courses include short ribs, Peruvian peppers stuffed with rice and seafood, New Zealand lamb shank, and grilled fish, shrimp, and octopus. Adventurous diners will find plenty of dishes to delight their palates — just what you should be searching for during a Floridian escape. From lobster to beef tenderloin, this menu is bursting with decadent options that you'll remember for a long time. Key Biscayne offers a tropical experience that you won't forget. If you want to get away from it all and head to someplace warm and sunny, visit Key Biscayne and relax on the beach, listen to the waves, and gaze up at the picturesque palm trees to your heart's content.